I don’t often wish I was 18 again but when it comes to buying whisky that was distilled in the year of one’s birth, it’s cheaper to be younger rather than older. I bought this bottle of Imperial in my first ever whisky auction, so I was excited to see several whiskies that were casked in the year of my birth (1970). I was winning 3 until gradually the prices went up and up until I was left with this Imperial. I’m certainly not complaining. I was after an example of Imperial for my collection. Since my collection is focused on getting single malt examples from every active distillery in Scotland, it might seem odd to want an Imperial given the distillery hasn’t been used for 15 years and was demolished this year. Well, the owners, Chivas Brothers, have announced plans to build a new distillery on the site of the old one. Although I’ve not heard any confirmation of this, there’s a good chance they’ll call it ‘Imperial’. And with that I’ll have an early example of a now reopened distillery! 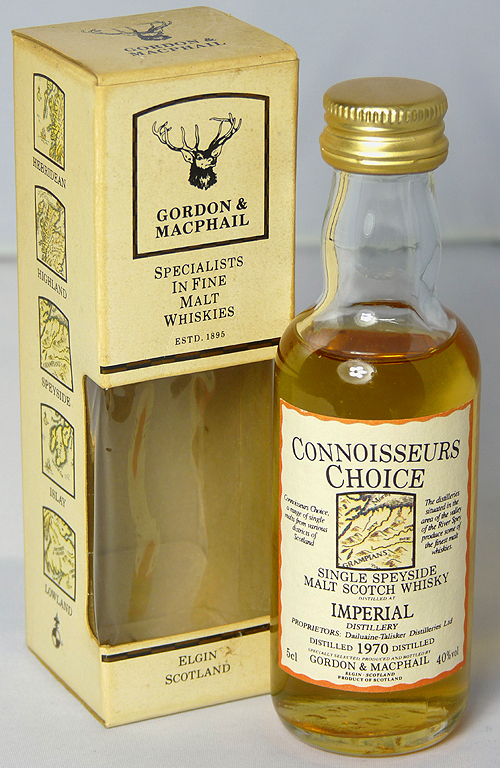 In an attempt to find a review of this bottling I discovered that Gordon & MacPhail also did a 1970 version with a brown label. Someone gave it a low rating during a tasting so I’m glad I don’t have that one! I also found this different version on Hard To Find Whisky for £40 for a miniature. I only paid £8 for mine, so I think I’ll be doing more auctions in the future!